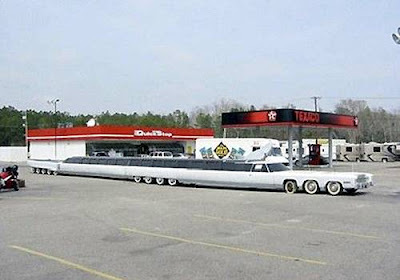 Carnation Auto Blog: Longer than Your Imagination - The Longest Car In The World! Who doesn't like to get noticed in life? Maybe that is what motivates people to do things that are different! The manifestation of the desire drove Jay Ohrberg, from California, US to built the longest ever limousine in the entire world! At 100-ft length, the world's longest car has also made it to the Guinness Book of World Records. 26 tires, two cabins for drivers (one each at the front and the back) and several other unique features make this limousine not only unique, but also a huge sensation. Equipped with all possible comforts ever imagined, like a heated Jacuzzi, a swimming pool, king sized bed, a sun deck, TV with the car's very own satellite dish, and even a helipad - make this humongously long limo, even more stylish and decadent than several of the Beverly Hills mansions or closer home, many of the Marine Drive homes! While driving this machine on the streets is not really legal, the limo can be booked for use for movie shootings, special events, & exhibitions. Its such a longest car of the world.Thanks for sharing such a wonderful blog! I really appreciate your content. The article has actually peaks my interest. I'm going to bookmark your site and hold checking for new information.